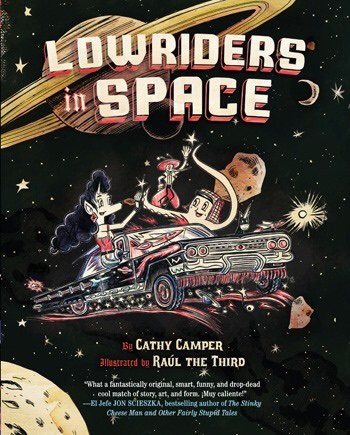 From the first frame which shouts, “GOOD MORNING,” in old-timey neon letters readers can’t help but get sucked in to Lowriders in Space. This fantastical tale of three friends who team up to make their dream of owning their own garage come true. Lupe Impala is a mechanic. Flapjack Octopus is a master car cleaner, he’s also a bucket sized critter who has huge anime eyes and wears a hat with earflaps. Elirio Malaria is the artist of the group. He is suave and uses his beak to create the finest detail work around. The friends learn about a car competition, specifically for lowriders and decide to enter the contest in hopes of winning the grand prize of cash. They end up on an adventure in space which includes some, (shh, don’t tell the kids who are reading the books), educational facts. There’s a glossary at the back of the book to specify scientific words and to explain some of the slang. Author Cathy Camper shows a masterful use of word choice which connects with illustrations in the flawless manner that allows the reader to fully dive in to each page. Seeped in Latino culture, there are references to food, language, music and style that will be fascinating to readers who haven’t been exposed to it, and rewarding for readers who don’t often see themselves represented in what they read. The illustrations are a real knock out. 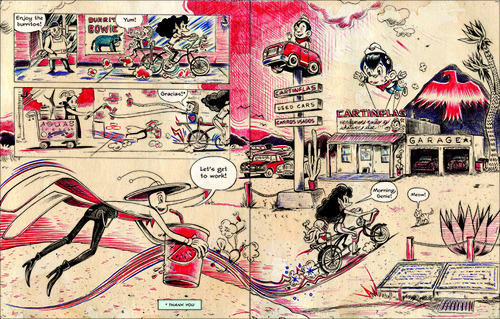 This is Raul the Third‘s first book illustration job and he chose to use a ball-point pen and sharpie doodle styling which is fun and unique without drawing to much attention to itself. Appealingly written and illustrated characters and surroundings make this one of my favorite children targeted graphic novels of the year. *Thank you Chronicle Books for providing me with a review copy of this title in exchange for my honest review.